Utilities | Glenn O. Hawbaker Inc.
Glenn O. Hawbakers’s Utilitiy operations are performed both independently and in conjunction with our Site Development and Road /Highway operations. Our expertly qualified crews install sanitary lines, pump stations, water lines, meter pits, and storm water management systems. 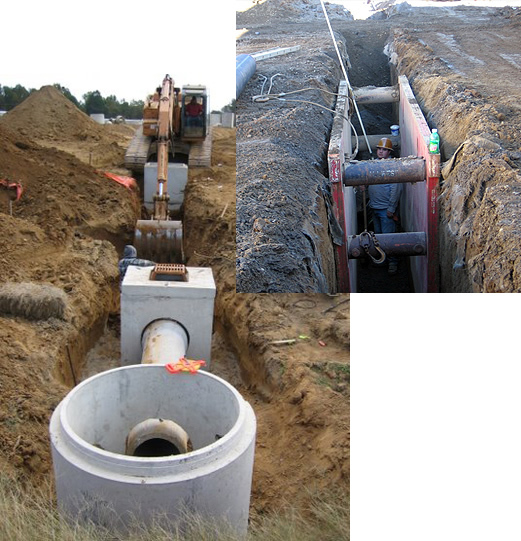 We provide trenching, bedding and backfilling services for electric, telephone, cable, natural gas site lighting installations. Steam tunnels, under-drain systems, and duct banks are also routinely provided specialty services. Our crews employ the highest level of safety training and execution standards for confined space situations and deep trench excavations.